The image gallery app in Nokia 500 is quite the looker. It's the updated gallery from Symbian^3 PR1.2, so it's not exactly new but we're still glad to see the change. Photos are displayed in a grid (3 columns) and you can scroll up and down (with kinetic scrolling no less). Once you’ve zoomed on an image, kinetic scrolling is still there but it's hard to trigger some times and that’s sure to cost the 500 a few points. On the positive side, opting between portrait and landscape mode is automatic, thanks to the built-in accelerometer. Selection of multiple photos for deleting or sharing is available straight in the gallery. The Send option offers only MMS, email or Bluetooth with no image sharing service integration. The Share key takes you to the Social app where you can choose between Facebook and Twitter social networks. Overall picture browsing and zooming is relatively fast, so we had no complaints of the gallery. Symbian never had trouble with the music player features but its looks were far from impressive. 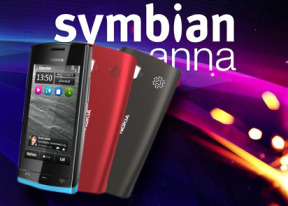 With Symbian^3 however Nokia introduced a new Cover Flow-like interface, which adds the much needed eye-candy. They haven't changed anything since. There’s automatic sorting by artist, album, genre and the option to create custom playlists straight on the phone. With the huge number of supported formats, equalizer presets and effects the feature set is complete. The Nokia 500 video player looks quite capable on paper but the actual performance was a letdown. The player supports DivX, XviD and MP4, but cannot play larger files properly (if at all), nor is it capable of 720p playback. WVGA clips are the limit. The media player app itself only works in full-screen landscape mode. A tap on the screen shows the controls, which are otherwise hidden. The video player is incapable of playing 720p videos or files bigger than 1.5GB or so. But that's hardly a problem, since even 300MB Xvid files turned out to be really hard to handle for the Nokia 500 - dropped frames, choppy videos and lagging sound. There is no subtitle support. The Videos section includes several extra apps. One is an editor that lets you create videos and video slideshows. The others are YouTube, CNN Video, E!, National Geographic, and a Paramount Movie Teasers application. They require an internet connection and not all content is free. The FM radio on Nokia 500 has the same neat and simple interface like on its Symbian^1 and ^3 predecessors. You can search skip preset and new stations alike with sweep gestures or you can use the virtual buttons. The 500 has RDS support and automatic scanning for an alternative frequency. This means that if you travel, the 500 should hopefully be able to auto-tune to your selected radio station. RDS is the best part of 500 radio app. The radio station name gets displayed with cool effects across the whole screen, while the rest of the readings are printed in nicely legible font at the bottom. The Nokia 500 didn't disappoint in our audio quality test. As a matter of fact it manage to bring a nice surprise by performing better than the Nokia 701. With no reistance applied to its line-out (when used with an active external amplifier), the Nokia 500 achieved great scores all over the field and it was slightly louder than its more expensive sibling. You probably won't be able to detect the difference with a naked ear, but it's still a nice achievement. 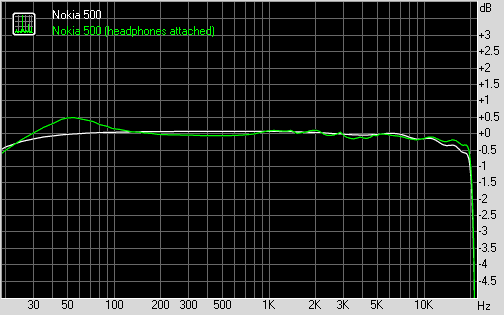 Even more impressively, the Nokia 500 experiences very little degradation when you do plug a pair of haeadphones. Stereo crosstalk increases less than we are used to, while intermodulation distortion jumps, but still remains at a good level. That's certainly a performance better than the price tag suggests.